Photo by Dell Carr 17 years after his death, the Luke Harrop Foundation has been established by the Harrop family to assist para-triathletes and triathletes with a disability. The following road closures will be in place on Sunday, 22 July 2018 from 5am - 12pm. All four lanes will be closed from David Morrison Way to University Drive for the period of the event. Access to Masters, Bunnings and the Orion Shopping Centre will be through Southern Cross Circuit, David Morrison Way and Main Street. Will be closed for the duration of the event. Robelle Domain can be accessed via Southern Cross Circuit. However, the event will be utilising footpaths throughout the Domain. Closed from Sinnathamby Blvd to Wellness Way. Hospital access will be via Springfield Central Blvd Health Care Drive. Will be closed for the duration of the event. Will be closed from Wellness Way to Springfield Central Blvd. Access out of Parkland Drive residential area be via Brock Drive, onto Grande Ave for the duration of the event. Will be closed from Parkland Drive to Grande Avenue. Exit from Opperman Drive be via Brock Drive for the duration of the event. Will remain open, but there will be no access to Sinnathamby Blvd. Exit will be via Southern Cross Circuit for the duration of the event. Please use Springfield Central Boulevarde & Health Care Drive. If you have any queries regarding access and road closures, please contact Triathlon Queensland on (07) 3369 9600 or events@qld.triathlon.org.au. Take exit 32 for Springfield Greenbank Arterial towards Springfield Central. At roundabout, take first exit onto Springfield Greenbank Arterial, then use the right lane to turn right into Sinnathamby Boulevard. Turn right into University Drive, then park in the designated parking areas. If you park in the far two carparks, you will not be able to depart before 12:00pm. If these parking bays are full, you will have to drive back out to Springfield Greenbank Arterial, turn left onto Main Street and find a park on Southern Cross Circuit and walk through the Domain. There will also be back up parking on Barry Alexander Way (access via Main St, Southern Cross Circuit and Barry Alexander Way). Please do not park anywhere in Education City Drive, Sinnathamby Boulevard, Healthcare Drive or Wellness Way as you will be on course and your car will be towed. Located right on Brisbane’s doorstep, Greater Springfield is Australia’s fastest emerging new city. It resides in one of the nation’s fastest urban growth regions and is the only fully master planned city to be built in Australia other than Canberra. Ipswich has much to offer visitors seeking rich heritage, adrenaline-charged adventure, the great outdoors, and some of Queensland’s biggest events. It’s all here in this thriving provincial city just 30 minutes’ drive from the Brisbane CBD and 45 minutes from the Gold Coast. 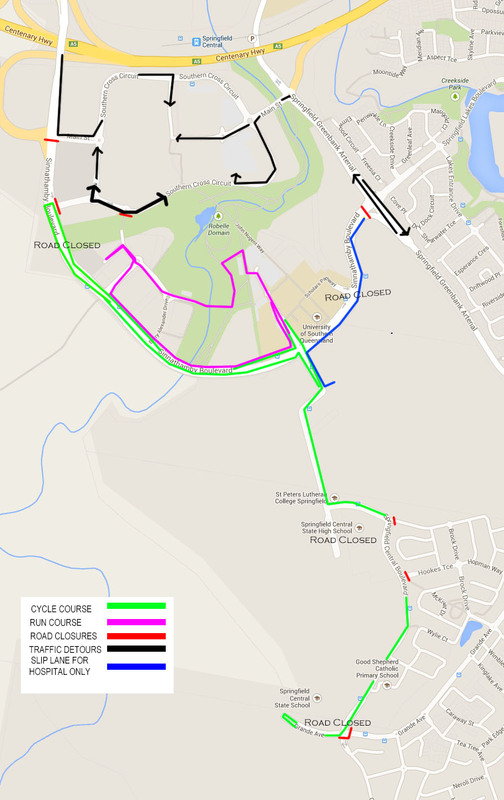 Parking will be available within Robelle Domain - participants wishing to park here will need to arrive before 5:30am and will not be able to leave until after the event is finished and the roads are open at 12:00pm. For ease of coming and leaving the event there is parking on Southern Cross Circuit road around the Orion Shopping Centre with only a short walk across Robelle Domain.